A leading American investment banking and financial services firm. Every day the firm’s analysts and investment banking professionals need to sift through hundreds of earnings reports, new research and other news items covering their field of investment. Today this is mostly a manual process. A lot of valuable insights are simply overlooked in this avalanche of data. The challenge is simple: Is it possible to automate the identification of potential engagement opportunities with AI? 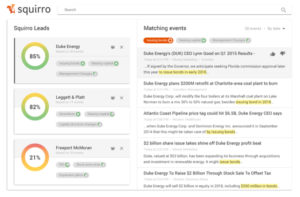 Squirro’s Investment Banking App analyzes thousands of research reports, news items & earnings transcripts daily. The system through its machine learning core identifies patterns that indicate upcoming engagement opportunities, e.g. management changes, divesture and financing announcements ahead of time. The identified opportunities are related back to the individual end user as a function of her coverage area and interests. The system automatically picks up insights usage and uses this information to further refine future recommendations. 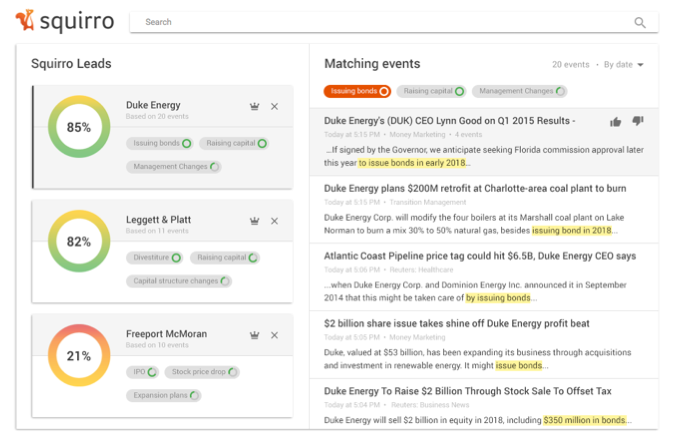 Squirro’s Investment Banking App has an immediate top line impact uncovering new engagement opportunities for our customer. Existing data sources are used more effectively to make a positive business impact. The analyst bench is able to identify market movements fast and boost opportunity generation. Interestingly the more proactive engagement model resulted better and more engaging customer relationships earlier in the deal life cycle. Read more about our Investment Banking App.